I know many Melanoma Patients turned away by Bristol Myer Squibb. The FDA just announced that they have approved Yervoy "ipi" for unresectable and metastatic melanoma. This is the first time a drug has been approved for melanoma in 13 years, so great news! "Late-stage melanoma is devastating, with very few treatment options for patients, none of which previously prolonged a patient's life," said Richard Pazdur, M.D., director of the Office of Oncology Drug Products in the FDA's Center for Drug Evaluation and Research. "Yervoy is the first therapy approved by the FDA to clearly demonstrate that patients with metastatic melanoma live longer by taking this treatment." Yervoy is a monoclonal antibody that blocks a molecule known as cytotoxic T-lymphocyte antigen or CTLA-4. CTLA-4 may play a role in slowing down or turning off the body's immune system, affecting its ability to fight off cancerous cells. Yervoy may work by allowing the body's immune system to recognize, target, and attack cells in melanoma tumors. The drug is administered intravenously. Yervoy's safety and effectiveness were established in a single international study of 676 patients with melanoma. All patients in the study had stopped responding to other FDA-approved or commonly used treatments for melanoma. In addition, participants had disease that had spread or that could not be surgically removed. The study was designed to measure overall survival, the length of time from when this treatment started until a patient's death. The randomly assigned patients received Yervoy plus an experimental tumor vaccine called gp100, Yervoy alone, or the vaccine alone. Common side effects that can result from autoimmune reactions associated with Yervoy use include fatigue, diarrhea, skin rash, endocrine deficiencies (gland or hormone), and inflammation of the intestines (colitis). Severe to fatal autoimmune reactions were seen in 12.9 percent of patients treated with Yervoy.When severe side effects occurred, Yervoy was stopped and corticosteroid treatment was started. Not all patients responded to this treatment. Patients who did respond in some cases did not see any improvement for several weeks. Due to the unusual and severe side effects associated with Yervoy, the therapy is being approved with a Risk Evaluation and Mitigation Strategy to inform health care professionals about these serious risks. A medication guide will also be provided to patients to inform them about the therapy's potential side effects. Yervoy is marketed by New York City-based Bristol-Myers Squibb. FROM COLEY TO ROSENBERG, LOTZE, ALLISON, WOLCHOK AND BEYOND! principles, thereby improving overall survival. therapy better, and will achieve greater clinical efficacy. 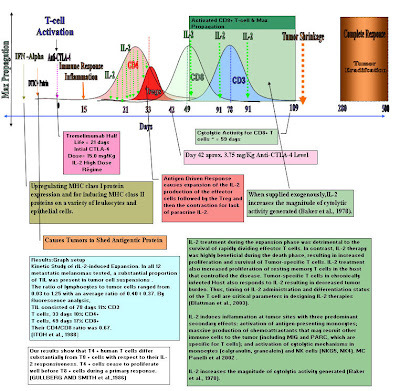 Where have you heard the key to an immune response is dose and timming. With This FDA Approval, This is the begining of the end cancer as we know it. 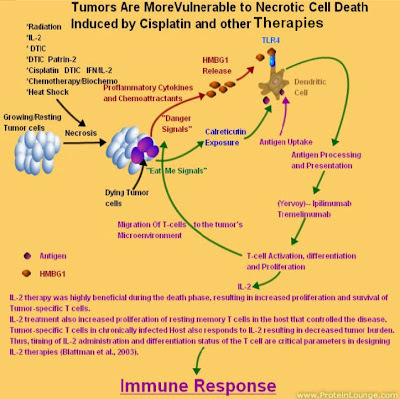 Ipilimumab will revolutionize Cancer therapy along with Anti-PD-1 and HD IL-2. Dr. Hy Levitsky is introducing Dr. Laurence Zitvogel from Institut Gustave Roussy, a leader in cell biology in cancer. New Speaker: Laurence Zitvogel, Ph.D.
"Dr. Zitvogel graduated in medical oncology from the School of Medicine of the University of Paris in 1992. She started her scientific career when she was at the University of Pittsburgh in Michael Lotze’s laboratory. She became research director at Institut National de la Santé et Recherche Médicale in a laboratory located at Institut Gustave Roussy, a large cancer center in Villejuif, France, and the head of the Center for Clinical Investigations for vaccine developments at Villejuif. Dr. Zitvogel has been actively contributing to the field of cancer immunology and immunotherapy, bringing together basic and translational research, including the design of cancer therapies through combined animal studies and phase I patient trials. Her expertise is mainly dendritic cell and innate effector biology and relevance during tumor development, as well as exosome-based vaccine designs." 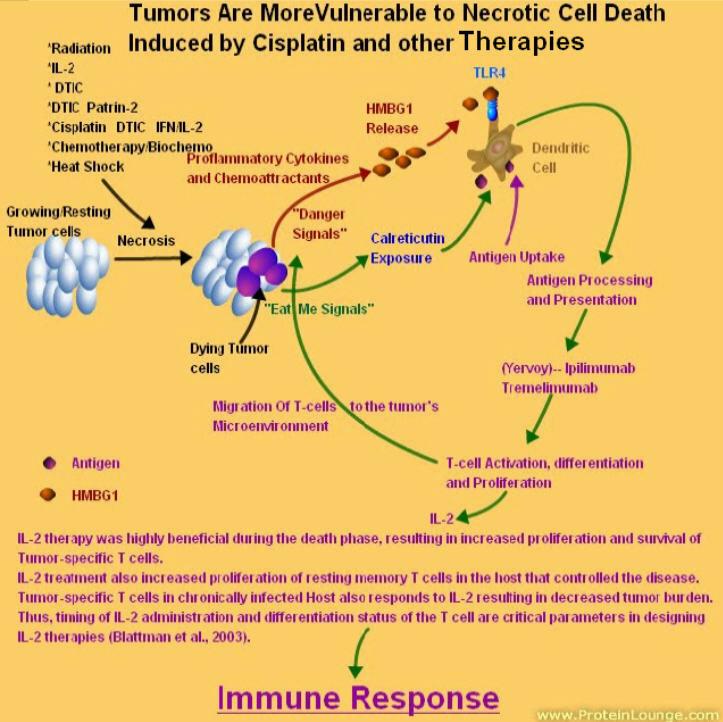 Zitvogel: Chemo causes cancer to express "eat me" or "come and get me" signals to the immune system. Nice way to phrase it! Autophagy Defintion: The process of self-digestion by a cell through the action of enzymes originating within the same cell. Zitvogel: "autophagy" is important to death of cancer cells. It breaks down in cancer growth. Chemo re-starts the autophagy process. Zitvogel: some types of chemo are better at inducing immunogenic cell death than others. Cisplatin and taxols aren't strong in this. Zitvogel: new tests can show how a drug falls short in triggering immunogenic cancer death -- and how to compensate for that. Zitvogel: Giving thapsigarin can improve cisplatin's ability to trigger immunogenic cancer cell death. Zitvogel: "drug repositioning" is the process of combining drugs to compensate for where one falls short in immunogenic cell death. Zitvogel: combining immunogenic chemotherapies with immunomodulators or other immunotherapy is a very promising strategy. "As a basic immunologist, EVC Director Dr. Rafi Ahmed studies immunological memory – the ability of the immune system to “remember” a particular antigen and respond accordingly. Dr. Ahmed and his colleagues have made significant discoveries about how immune memory cells are created and how long they survive; understanding these mechanisms is crucial to the development of vaccines for HIV and other infectious agents. In addition to contributing vitally to vaccine science, Dr. Ahmed’s findings are being applied to research into therapies for the treatment of cancer and the prevention of organ rejection." Dr. Rafi Ahmed is now being introduced by Johannes Vieweg, & highlighting his work on immunological memory Dr. Ahmed is sharing how lessons from immune memory development in chronic viral infection can inform cancer immunotherapy field Ahmed: wait 30-60 days to boost in vaccination produces better immune responses for many types of viral vaccines. Same for cancer? 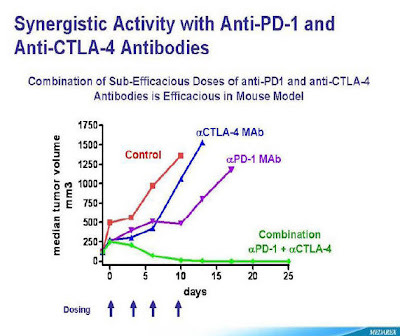 Ahmed: Synergy we've seen combining PD-1 with IL-2 (negative + positive signal) in viral infection therapy have been astonishing. 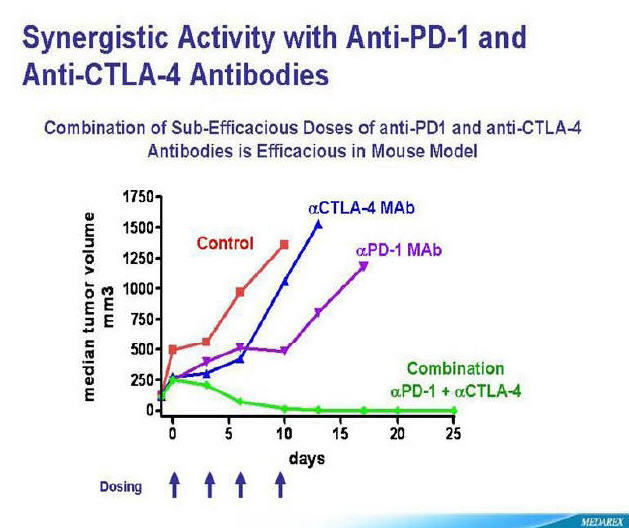 Jimmy B:Imagine if you combine CTLA-4 + PD-1 and IL-2. The Holy Grail of Immuno therapy I believe.Ahmed raises point that mTOR inhibition may enhance vaccine-induced memory CD8 T-cells. Role for combining with cancer vaccines? Much audience Q&A for Dr. Ahmed - when see exhaustion clinically, is it inhibition, effect of dose of IL-2, and role of autophagy? When it works, it works quite well.